Saturday night student partiers wander into Telegraph demo. Photo by Ted Friedman. 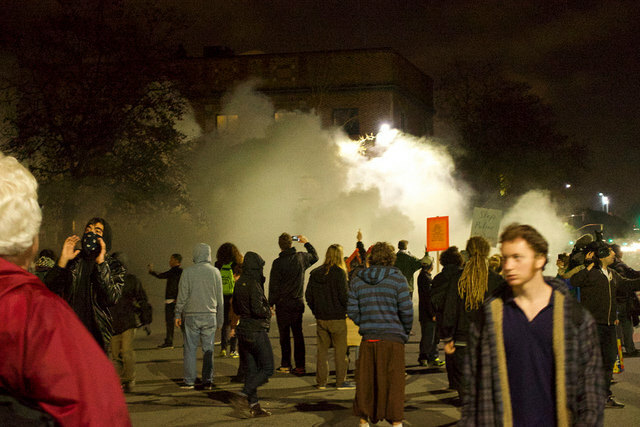 Students who stumbled onto the demo, as they returned from Saturday night parties or clubs, were not prepared to riot. View from poles. Photo by Ted Friedman. 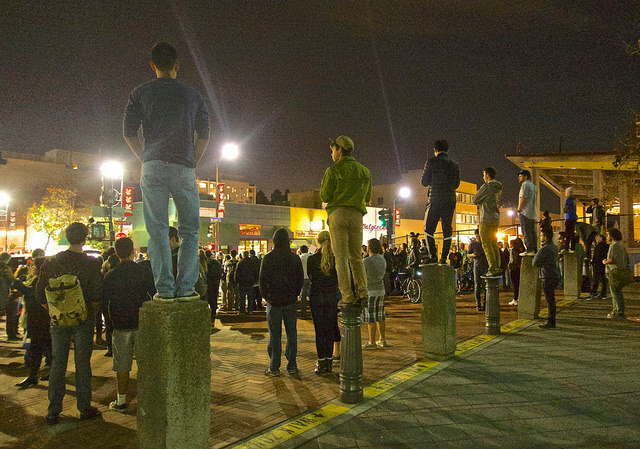 Cal students stood like graceful birds, or daring acrobats, on six poles overlooking a police cordon across the street. In order to mount the poles they had leaped six feet from a stand-still, a feat I’d seen them do, routinely, in the gym. Protesters had been trapped like this before. In fact, I had been caught in such a cordon weeks earlier and was unable to get out. 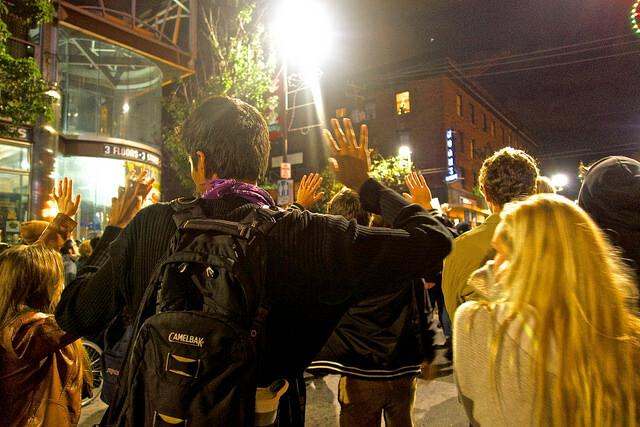 This time, police were letting protesters out, gradually, on Bancroft Way. Tapped. Photo by Ted Friedman. 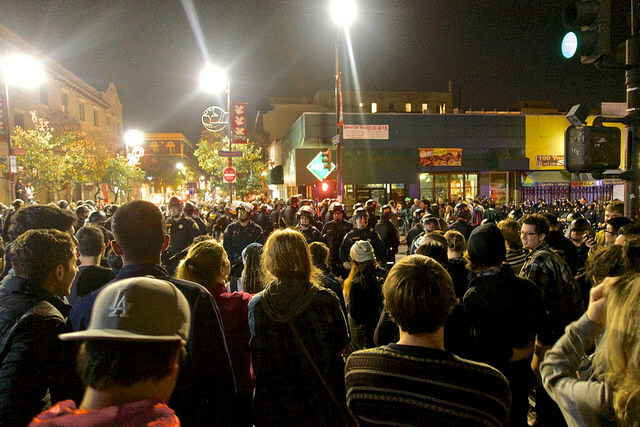 “This is an illegal assembly,” announced an officer on a bull-horn. This was the sixth such warning I’d heard on a march that wound up near the Berkeley Marina and which had marched back to campus. 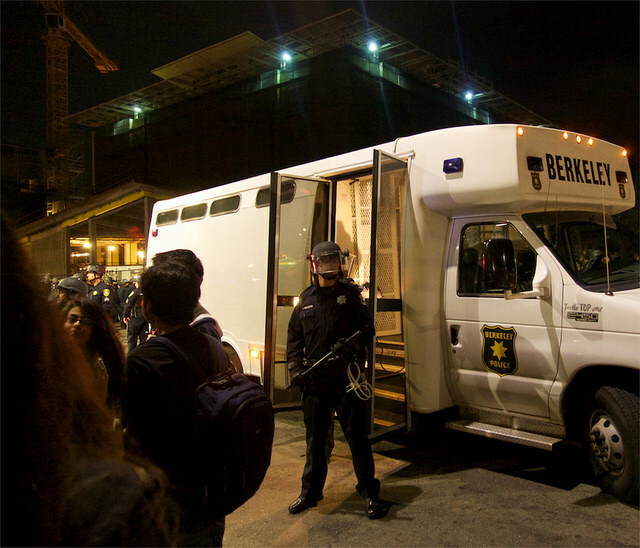 Berkeley police jail-van at the ready. Photo by Ted Friedman. After yet another warning, I decided to leave while I could and this time I was not stopped trying to get out. As I walked away from the demo on Telegraph Ave., headed for the Caffe Mediterraneum, I saw curious students walking in the street on Durant, which police had closed to traffic. I could hear them wondering aloud what all the commotion was about. They were soon to find out and I was not. A Saturday night security guard at Pappy’s sports bar had locked the door and was waving customers off. Caffe closed its door, too, but I got in. When the first wave of tear gas wafted into the Med, the Med staffer closed the door to all. Med Owner Craig Becker was let into his own cafe. Becker flashed one of his I just ate a snake looks and said that the tear gas was stimulating. He recommended I try it, as if we were in a tear-gas tasting contest. I rose to the gag. 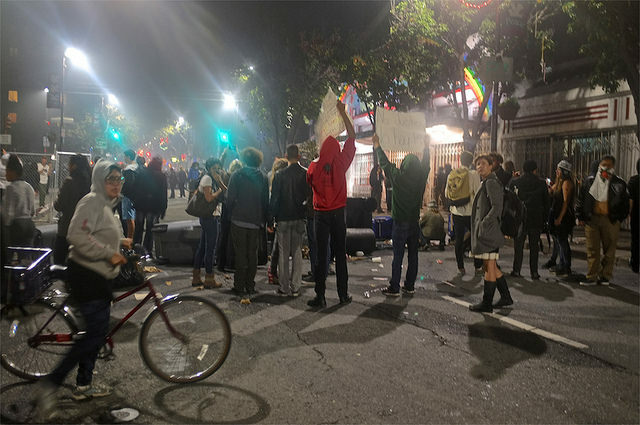 As I emerged from the Med, I got a low-dose of eye-sting and an acrid taste, but proceeded to nearby Haste Street to take a photo of a phalanx of–mostly deputies from East-Bay sheriff’s departments and CHP–descending on Telegraph, which was now cleared of a last-stand band of demonstrators. Last Stand outside Cafe Med as cop phalanx about to converge. Photo by Ted Friedman. 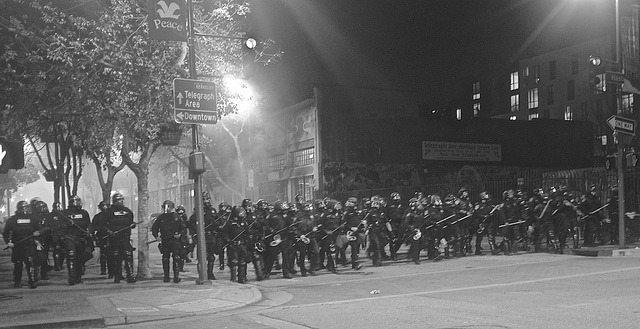 As the police phalanx neared, I could see clouds of tear-gas behind them. Cop-op Cows Telegraph Demo. Photo by Ted Friedman. How not to get gassed in Berkeley had gotten me half-gassed. This entry was posted on Monday, February 9th, 2015 at 7:31 am	and is filed under Telegraph Avenue, The Berkeley Scene. You can follow any responses to this entry through the RSS 2.0 feed. Responses are currently closed, but you can trackback from your own site.